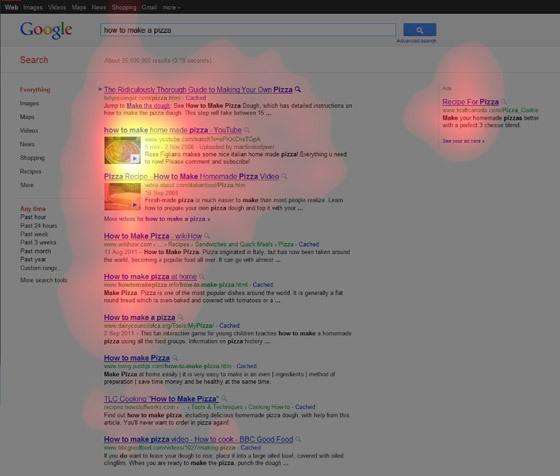 If you pay attention to the search engines news you probably know that Google has been making big moves in 2011. Throughout the year, Google has been making a series of updates known as Panda. Some sites have been penalized and others have been rewarded. By the looks of most search engine results pages there have been some minor improvements. Something I’ve noticed about the changes has been a push by Google to increase the importance of a strong brand. If you thought blogging was difficult before, now it’s even more difficult. Google wants your company and your blog to have a strong brand that’s well known outside of the web even before providing you with strong rankings. The Panda updates have been a move by Google to improve the quality of their search results. To improve their results and improve their own credibility, Google has been giving more importance to well known brands. It’s a safe move by Google. 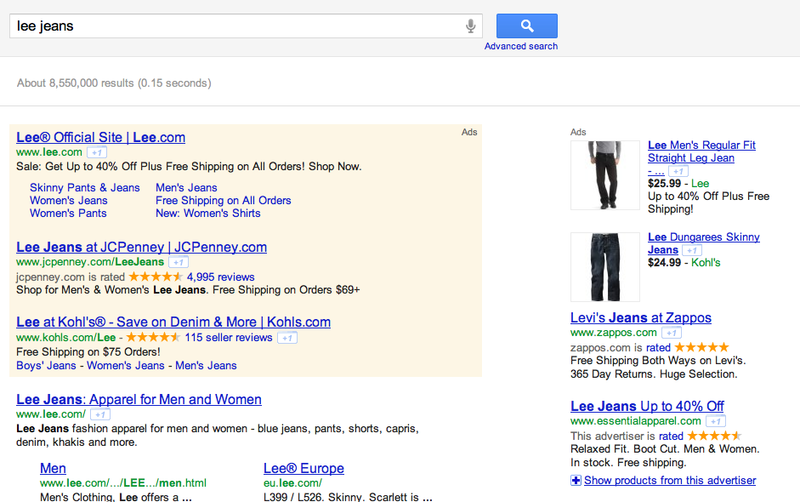 It’s easier to give brands top space on results pages. People are familiar with popular brands. These folks are less likely to think they’re looking at spam when they see familiar brands in the search results. Lee jeans are a popular brand of men’s and women’s blue jeans. For much of history people have purchased Lee jeans from retailers and catalogs. Today, these retailers aren’t important in the eyes of Google. The real winner is Lee. Check out that search result. Lee gets top billing in the paid slot above. They have site links under their paid ad. Down below in the natural ad Lee gets the top result and large site links underneath. There are a few smatterings of other paid ads on the top and on the side. This shot cuts off just about at the fold. Any natural result that’s not #1 in this case is not really worth having at all. For one, Google is making money off this search term. Paid spots take up about 75% of the real estate. Google even uses the reviews in paid ads (not in natural ads). And it makes sense. Why shouldn’t Lee have the most real estate for their own brand? This is the direction Google is going. Strong brands will win. The goal of your business should be to increase your brand recognition to increase branded searches. So brand is what’s becoming important, but Google is still playing a little favoritism with their own brands. One of the big stinks about Panda has been about the increase in rankings for Google’s own YouTube. Here is a result for a popular country song from 2011. The top four, four, results are all YouTube results. I’m cool with it. People likely want to listen to the song they’re searching for and watch the video if available (there is a music video for this song). Now look at this great graphic from a fellow over at SEOmoz.org. He was able to look at how people interact with videos on the search results pages. People don’t even care about the top result. The #1 result is worthless. In this instance a site needs a video to be relevant for searchers. Taking this into consideration we can assume Google is making big time bank on the increase in traffic to YouTube. The difficult thing to understand is that Google is giving more recognition (in this one instance) to their own brand over the singer’s own brand. 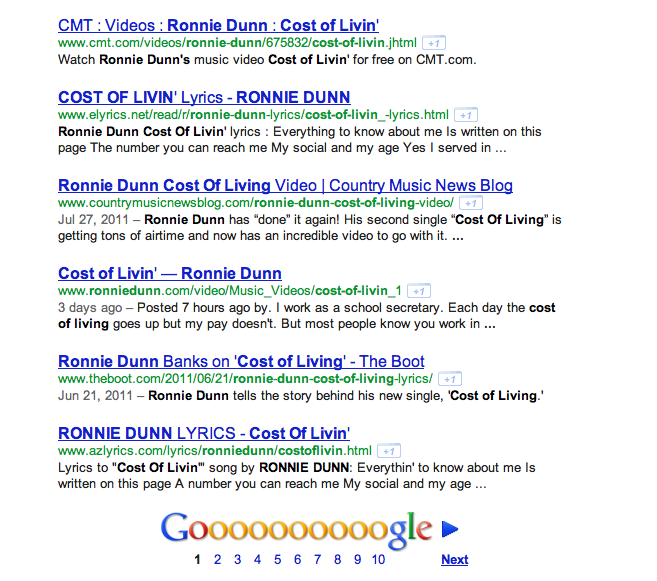 Here is the rest of the SERP for ‘Ronnie Dunn Cost of Livin’“. There’s Ronnie’s page. It even has the official video. It’s safe to assume poor Ronnie is getting next to zero traffic in this case. 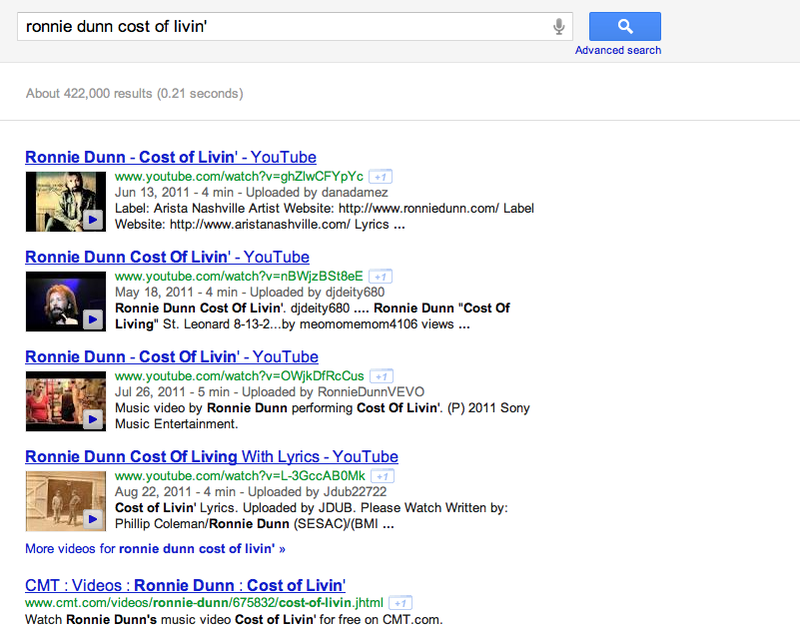 As he works hard to get more people to search for his song he finds the work in vain as it pertains to his own website. At least people can still hear the music on YouTube…I guess. Your blog is more than just finding relevant keywords. The future of blogging will be about building a strong community of followers and customers. Your blog will be about increase the awareness of your brand – both your company’s and your blog’s. To do this you’ll need to write, photograph, design, and produce videos people find interesting. As a result, people will share your content. Your brand will gain recognition with your target audience. People will search for your brand names and you’ll be rewarded by getting the entire top half of the natural results on the SERP for your brand. This blogging strategy is possible and it’s probably always been the correct way to look at a blog -as a brand builder and community builder. Doing this is more difficult than the old ways of blogging – targeting simple keyword phrases, but I think in the long run building your brand will be more beneficial – anything worth working hard for usually is. What are your thoughts about the recent brand push by Google? What is your company doing as a result of this trend?